On Wednesday night, due to the "no" votes of Council Members Theresa Castellano and Beth Mason, a flooding solution for western Hoboken was voted down. The city secured a low interest loan to fund a flood pump uptown near 11th Street, which would help alleviate flooding on the west side of town, near the Shop Rite, which has historically seen chronic flooding. 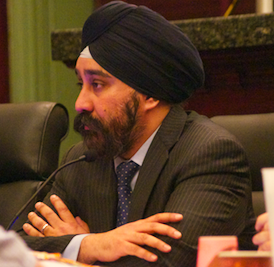 Talking Ed Note: Six votes are required to approve a bond effort on the Hoboken City Council. Voting in the affirmative: Council members Peter Cunningham, Dave Mello, Jen Giattino, Jim Doyle and Council President Ravi Bhalla.